Designed to keep potentially harmful water out of a structure during construction, the new ForceField™ Air and Water Barrier System from Georgia-Pacific consists of engineered wood sheathing panels laminated with a proprietary air and water barrier. ForceField debuted at the 2016 International Builders' Show in January. 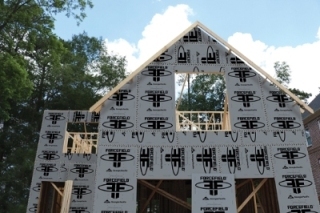 Georgia-Pacific recently introduced ForceField(TM), a new building product that not only shields exterior walls from harmful moisture and air, but also speeds up a home's construction. ForceField is an innovation that combines wood sheathing panels and a weather barrier for an all-in-one product. "Early builder feedback was positive, and this sentiment was reinforced many times over at IBS," said John Beers, sales director for engineered wood at Georgia-Pacific. "From builders to contractors and architects, our booth stayed packed with interested attendees during the show. Everyone wanted to see ForceField and learn more about it. We look forward to sharing it with even more customers in the months to come." How it works: once ForceField wall sheathing is installed on a structure, the panel joints are taped with ForceField seam tape, which helps prevent air infiltration and leaks. Together the panels and the seam tape create an integrated air and water barrier system that eliminates the need for house wrap. "The ForceField installation process is a jobsite time-saver compared to typical house wrap installation," continued Beers. "Studies have shown a time savings of up to 37% when installing an integrated air and water barrier. There's no unrolling, fastening or calling in multiple crews to install house wrap; ForceField panels are installed like standard plywood or OSB sheathing panels, then once the tape is installed, you're done." Perfect for residential or light commercial applications, ForceField panels are available in 7/16 CAT thickness, and sizes of 4x8, 4x9, and 4x10. ForceField seam tape is currently available in 3 in. x 165 ft. rolls. ForceField comes with a lifetime limited warranty for the homeowner and a two-year pre-installation warranty for the builder. For more information go to: www.gpforcefield.com.